..:recycled minds:..: Views from the ANThill: What if Everything was Free? 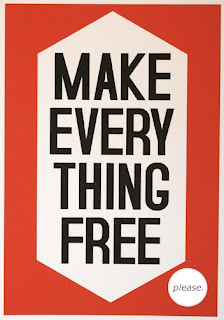 Views from the ANThill: What if Everything was Free? I've been thinking about the concept of "free" a good deal lately. Our recent posts on for-profit universities, Open Access (the ability to access research reports and articles for free), and internet access reflect that thinking to a certain degree. But I would like to take the idea a bit further than we have so far. If internet access is to be a human right, it needs to be free. I would argue that education - all of it - needs to be free. And the ability for anyone anywhere to access the latest research needs to be free and unhindered. All of these things are related and intertwined in that they exist in the realm of knowledge and human understanding. What about things that we traditionally think of as goods? Products? Should these things be free? A good friend of mine just shared an article from the Wall Street Journal on the declining success of "freemium" - a strategy employed by a number of online ventures in which they offer a basic service for free, with hopes that customers will pay for premium services. Companies like Dropbox and Skype have demonstrated that the idea can work, however, others have been a bit less successful. Apparently it takes a special formula and specific criteria for such a strategy to work, especially if the end goal is to make money. But what if the end goal was different? What if everything was free? My training and study in anthropology has included a good deal of time examining social inequalities around the globe. Billions of people around the world, from those in our largest cities to others in the most rural of villages, have no money. Their ability to obtain money is greatly hindered by a range of structural issues, including limited access to education and health care, a lack of jobs, and polluted living environments to name just a few. Further, these billions are embedded in an increasingly global culture of consumption in which we are taught that the latest phone, mp3 player, or laptop should be foremost of our desires. The result? More and more young people are spending what little resources they have on the latest gadget, at the expense of food, medicine, or education. But I want to ask, what if everything was free? Our current embracing of the path of capitalist consumption does not appear likely to address the social problems that it creates. The widening call to cut, cut, and cut some more funding to social services like those mentioned above - health, education, and even consumer protection, only serves to enrich the haves and further deprive the poor. Witness the continued growth of the gap between the rich and the poor, and it becomes questionable if this trend will be reversed? These days, if you're lucky enough to be one of the haves, the question becomes not how much can you sell, but who are you going to sell it to? But I want to ask, what if everything was free? If we can agree that our current path isn't looking that great, then we need to ask ourselves what an alternative might look like? 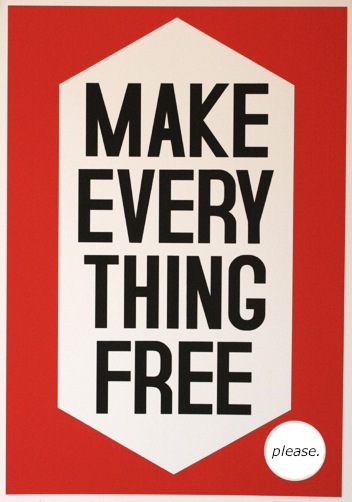 Could it be possible for everything to be free? What would such a system look like? Many people argue that things that are free are not valued. For instance, a doctor that I recently interviewed here in southern Belize, where primary health services and some medicines are free, thought the fact that these things are free causes more problems than it solves. "People start to think they deserve everything for free, and they get upset if what they get is not the best quality," he explained. "Free health care has created demanding, yet apathetic patients that can be difficult to deal with." He knows people here have limited income, so instead advocates for very small co-payments for services and medicines. This way, some money is coming into the system (which is quite stressed financially), which will help offset costs, while in theory, a sense of value is imparted on to the services - something that he feels is currently not present. So then is this a better question to ask - what if everything was low-cost? Or maybe: What if everything was subsidized? Perhaps a world in which everything is low-cost and subsidized would be an easier transition for us to make. But if you we want to create a more just and vibrant world, based on equality and freedom, we have to start asking ourselves what this world will look like. It's becoming quite obvious that things are not going in that direction now, so we need a plan through which to work. What are our goals? What do we want the future to look like? What if everything was free? I don't think people in the U.S. would know what to do. We can't even imagine that world. It would be like asking what it would be like if there were no gravity. Free stuff? Sounds like the 60s man. Forget it hippy. I just can't wrap my head around this, although I'm not saying it's a bad idea. But if everything were free, then people would presumably be able to do whatever they like, in addition to making sure their human needs were met (food/clothing/shelter - which, I suppose, would be a full time job). But beyond that, if I wanted to watch a movie, for instance. Of course there'd be plenty of people willing to act, direct and film the movie. But who would make the actual equipment? Where would the parts come from? Does the idea of free stuff only work now -- in our present moment, because we have so much stuff already? And once it runs out, it's gone? Is the idea of watching a movie too plebeian for this conversation? I'll just reply to all right here in a new thread - I agree that it's a fairly radical idea to think about, and in a way that's my point in asking it. We need something - some idea, event, or something - to get us thinking in a new way about how to go about life on this planet. I bet there are enough of the desired products out there that every household in the world could have one of everything. That would be an interesting figure to see - at least on things like phones, computers, cars, refrigerators, and other items that we have deemed essential to modern living. Say we could get everything distributed, then what? How would we move forward? Who would mine the precious metals needed for cellphones? Who would put those phones together? What if we could automate it all? In a way, I'm suggesting that we stop right now, and reassess our situation as if our children would have to do the dirty work. What changes would we make? How would we make them? And the movie question is a good one - not only who would make the equipment, but who would make the popcorn and candy that we all so love to snack on? Who makes sure the theatre doesn't overfill? Who cleans the restrooms? Is it human nature then, to have hierarchy? As for the 60s comment - I know they did some experiments in the 60s and 70s with free stuff. I think there were even "free stores" - what of it? I don't see what's wrong with the idea of helping each other out, and I think very few would actually be free loaders as you seem to be implying. It's not all about you. It's not all about me. We're all in this together, and I'm suggesting we start acting like it. "You never change things by fighting the existing reality. To change something, build a new model that makes the old model obsolete." Let's build a new model. Maybe a simpler way to ask this question would be "what if anything were free?" Pick any one thing - what if that were free? ha, good point. is there anything in this world that is really free? what does it mean for something to be free? everything has its costs in one way or another!